The Adjustable Pil-O-Splint features a single hook-and-loop fastener(s) strap that allows for easy adjustment of fit and desired compression. Use for Carpal Tunnel Syndrome, forearm Tendinitis, Arthritis, post wrist sprains and fractures, post-operative rehabilitation, mild spacticity. Designed by Ian MacMorran, MD, an orthopedic and hand surgeon to help his patients sleep throughout the night. 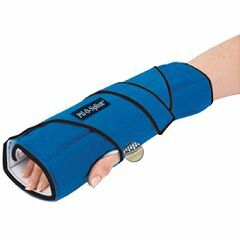 This exceptionally comfortable wrist splint provides pain relief throughout the night leaving you rested and readyfor a productive day. The patented Pil-O-Splint is shaped for maximum healing benefits by gently immobilizing the wrist, hand, and fingers in a neutral position. Its unique design prevents you from holding your hand in a harmful position while sleeping. A single hook and loop strap allows for easy adjustment. Soft and comfortable, breathable foam and cotton lining. Machine washable. Latex free. One size fits either hand. Stabilizes. Effective. Easy To Use. comfortable. Works for me for carpal tunnell and trigger finger. Sturdy. Easy Storage. Safe. Lightweight. I use it at night to help my husband's hands and wrists which are getting deformed. He has Alzheimer's and Parkenson's. It works fairly well, though I wish it were a little more rigid. It seems comfortable for him. So far I have just one and alternate hands each night. I haven't decided yet whether it would be uncomfortable for him to have one on each hand at night. Bulky. Hot to sleep in! Difficul. Hot to sleep in! Difficul. Hot to sleep in! . This product does stabilize your wrist and the pain relief is noticeable after the first use. However, for the price I am disappointed. It is hot to sleep in, and difficult to move and be comfortable in. I think this product needs improvement or competition. Lightweight. Sturdy. Effective. Stabilizes. Easy To Use. Easy Storage. Safe. I wear these splints every night in bed. I go to bed in pain and wakes up with none. can this splint be used to help flatten wrist and fingers of a stroke person? fingers are curved and hand is always closed and I would like a splint to straighten the left hand. No, it is very soft and bendable,when curling your fingers. It does a great job not letting the wrist lift upwards. Really supports the wrist! I love it! This splint did not work for my Mother, she was very uncomfortable.